WASHINGTON, DC, October 8, 2012 (ENS) – The U.S. Fish and Wildlife Service has rejected a petition by conservation groups to list the endangered Mexican gray wolf separately from other gray wolves. Wyoming hunters have new license to kill wolves on sight, and Washington state officials killed a wolf pack on public land. U.S. Fish and Wildlife Service Friday announced its determination that the Mexican wolf, Canis lupus baileyi, does not currently warrant separate classification under the Endangered Species Act and will continue to receive federal protection as an endangered species included within the existing species-level listing of gray wolves, Canis lupus. The Service gave no reason for its determination but said it is in the process of revising and updating the Mexican wolf recovery plan, which is expected to be released for public and peer review in 2013. “Certainly, the most important thing the Service can do right now is to complete a scientifically valid recovery plan for Mexican gray wolves, and release more wolves into the wild,” said Sargent. Although fewer than 60 Mexican wolves remain in the wild, the release of more is not likely given the response of the Service late last month to a formal complaint from Public Employees for Environmental Responsibility, PEER, which challenged the cogency and accuracy of findings by an agency official who rejected calls for independent reviews of complaints involving political manipulation of science regarding Mexican wolf recovery. Conceding failure after years of recovery efforts, in 2010, the Service began a new Mexican wolf recovery process. In a complaint filed this June under new Department of Interior scientific integrity rules, PEER detailed how the scientists assembled for this new process were pressured to water down and alter scientific findings. Instead of bringing in outside reviewers as it has for other complaints, officials at the Department of the Interior asked the Service to review itself. The investigation was handed to an FWS career official, Richard Coleman. In his September 25 reply letter, Coleman dismissed all the complaint specifications, giving no evidence for his defense. “This official self-vindication by the Fish and Wildlife Service is an embarrassment. This response employs standards and methods that make Interior’s vaunted scientific integrity policies an utter joke,” said PEER Executive Director Jeff Ruch, noting that a Bureau of Reclamation Scientific Integrity Officer was abruptly removed after elevating scientific integrity concerns. “This exercise should stand as Exhibit A for subjecting complaints of political manipulation of science to outside scrutiny rather than having officials investigate their own chains of command,” said Ruch. 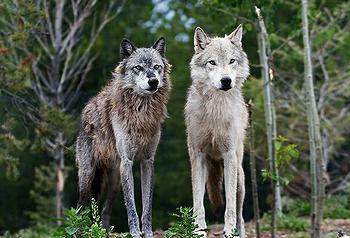 In Wyoming, hunting season for the state’s remaining 328 wolves began October 1. Wolves can now be shot on sight and trapped throughout most of the state. It is legal to gas wolf dens, kill wolf pups, and bait wolves into conflicts as a pretext for wolf killing. The new policy began September 30 when the Fish and Wildlife Service’s decision that removed wolves from the federal Endangered Species List and turned over wolf management in Wyoming to state officials took effect. The Service says the Wyoming population of gray wolves is recovered and no longer warrants protection under the Endangered Species Act. But another court battle is in the works. On September 10, a coalition of conservation groups, represented by Earthjustice, served 60-day notice that it will file a court challenge to the federal government’s removal of Endangered Species Act protections for Wyoming wolves. Last year Congress gave hunters and trappers in Montana and Idaho the right to kill wolves that had been protected under the Endangered Species Act, nullifying a court victory won by Earthjustice that would have prevented the hunts. Since then, management of wolves in the two states has grown increasingly hostile as the states have expanded their wolf quotas and hunting seasons. 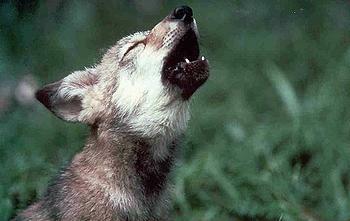 In the 2011-2012 hunting season, hunters and trappers killed 545 wolves in Idaho and Montana. The two states have designed wolf-hunting regulations for the 2012-2013 season that will result in even greater wolf killing. Even while approving state management in Montana and Idaho, the Fish and Wildlife Service in the past denied this authority to Wyoming due to its anti-wolf laws. Since then, Wyoming’s wolf-management laws have only slightly changed, reducing the area where year-long, unregulated wolf killing is permitted from 90 percent of the state to about 85 percent. Wyoming retains unrestricted wolf killing even in that five percent of the state for much of the year; thus conservation groups contend that Wyoming law remains inadequate to protect wolves. After being exterminated from the western United States, including Wyoming, in the last century, wolves have made a comeback in the northern Rockies, which has helped reestablish ecological balance and boost the regional economy. Yet Wyoming’s wolf population, estimated at 328, is small relative to its neighbors in Idaho and Montana. The notice of intent to sue over the Wyoming decision by Defenders of Wildlife, Center for Biological Diversity, Natural Resources Defense Council and Sierra Club follows years of legal work by conservationists to protect wolves in the northern Rockies until their population could sufficiently recover from near extinction and state laws were in place to safeguard their recovery. Beginning this fall, the Wyoming Game and Fish Department says it will monitor wolf populations by capturing and radio-collaring wolves in areas of Wyoming where wolves are designated as trophy game animals. After much controversy, on September 27, the Washington Department of Fish and Wildlife announced that an agency marksman had killed the Wedge Pack’s alpha male just south of the Canadian border in northeastern Washington. 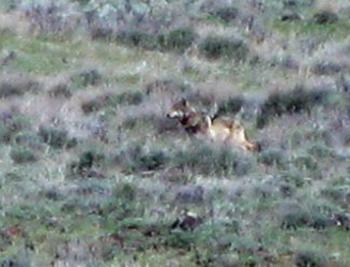 WDFW Director Phil Anderson said the wolf was shot from a helicopter. Its death brought to six the number of wolves from the Wedge Pack removed in the preceding three days, including the alpha female. The department initiated removal of the Wedge Pack to stop what Anderson called “its persistent attacks on livestock from the herd of the Diamond M Ranch in northern Stevens County.” Since July, the wolves had killed or injured at least 17 calves and cows from the herd, he said. The Diamond M cattle were grazing on public land; conservationists say wolves have greater rights on public land than do cattle. State Senator Kevin Ranker, a Democrat, chairs the Energy, Natural Resources and Marine Waters Committee. His letter notes that the Diamond M landowner “refused to participate” in wolf attack prevention efforts. About 100 people attended a public hearing Friday in the Washington state capital, Olympia, about the state’s decision to kill the Wedge Pack. An official with the Department of Fish and Wildlife opened the meeting by saying that agency members have received death threats over the issue. He advised the crowd that there were uniformed and undercover police officers in the room “prepared to take action” if necessary. Mitch Friedman of Conservation Northwest, a group responsible for confirming the presence of wolves in several areas of Washington state, agreed the pack should be destroyed. But Friedman is demanding assurances be made that this won’t become the preferred method of wolf management in the state. He blames the owner of the Diamond M, Bill McIrvine, for not doing enough to protect his herd from wolves. He pointed out McIrvine did not participate in a range riding program that several other ranchers invested in, and he believes since McIrvine is running his cattle on publicly owned national forest land, he should have to adopt other modern methods of herd protection. McIrvine said in an interview with KING 5 in July that he believes “radical” environmental groups are “conspiring” to introduce wolves in order to force ranchers off public lands. Conservationists claim the state’s decision to use lethal force was based on reports of cattle losses blamed on the Wedge Pack but some of the reports gave no evidence that wolves were responsible for the livestock deaths. On October 3 the California Fish and Game Commission voted unanimously to make the gray wolf a candidate for protection under the state’s Endangered Species Act. The decision gives wolves immediate protection under California’s Endangered Species Act while the California Department of Fish and Game decides if long-term protections are warranted. The department will do a one-year “status review” of whether to give California wolves more permanent protection. The decision came in response to a petition earlier this year by the Center for Biological Diversity and other conservation groups who argue that California will be vital to restoring wolves to suitable habitat along the West Coast. Wolves were absent from California for more than 80 years until last December, when a male Oregon wolf, referred to as OR-7 or “Journey,” entered the state. The wolf is outfitted with a tracking tag so he can be studied by government scientists. Ranchers and at least three rural counties in the state’s rugged, sparsely populated north oppose the plan, saying it is an unnecessary use of public money for a species that already has federal protection. While the actual cost of the state’s one-year study is unknown, it will be partially funded by a $300,000 federal grant. The wolf was hunted to extinction in California in the early 20th century. OR-7 is believed to be the only wolf in the state. OR7 was born in northeastern Oregon in spring 2009. It weighed approximately 90 pounds when collared with a radio transmitter by Oregon Department of Fish and Wildlife in February 2011. It is referred to by biologists as OR7 because it was the seventh wolf radio-collared in Oregon. Its collar transmits location information to satellites daily and is expected to continue to function until at least 2013.